Last updated on November 18th, 2018. 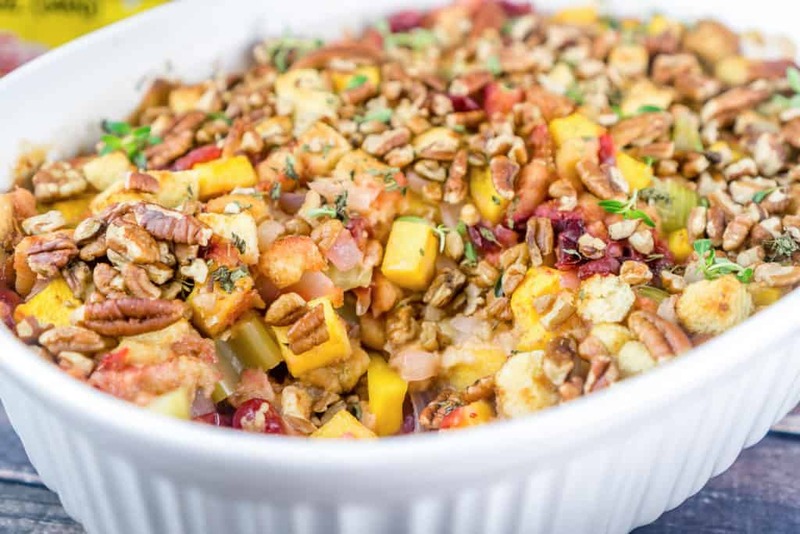 Switch up your Thanksgiving stuffing routine with this Butternut Squash Thanksgiving Stuffing Recipe – you will never go back to traditional stuffing again! I am very excited to partner with Martin’s Famous Potato Rolls and Bread who sponsored this post. Last week I went to a friend’s house for some much needed catching up and a play date for our boys. I walked away with a GIANT BUTTERNUT SQUASH because she had two of these bad boys. Look at this monster! Just look at it!! It took me two days to chop it up and divide it into manageable amounts. I mean, it didn’t take me a full 48 hours, but I did have to do this in two sessions because there was just so. much. chopping. And now my freezer is stocked with cubed butternut squash; as are my family’s freezers. And my neighbors’. 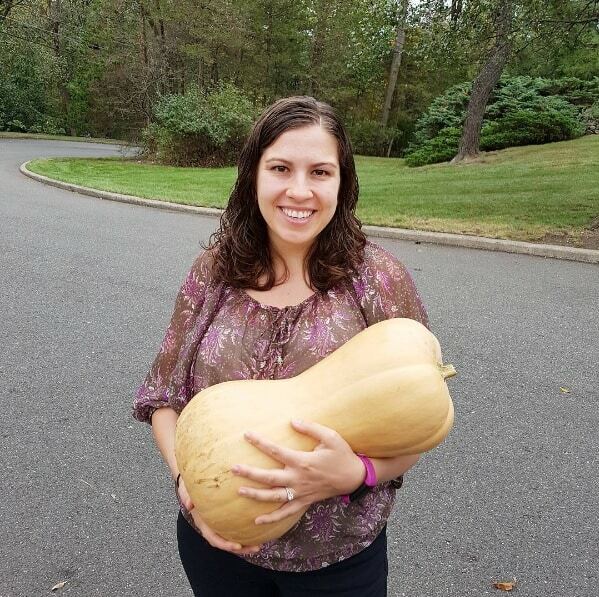 You will not believe the amount of cubed butternut squash you will get from a 20 lb squash! And I have the seeds cleaned, dried, and ready to be roasted. YUM! Some of the squash will be turned into soup, obviously. Some will be roasted and go on top of a salad, such as this awesome Roasted Winter Vegetable Salad. Some of it will go into my Baked Chickpeas and Butternut Squash dish. 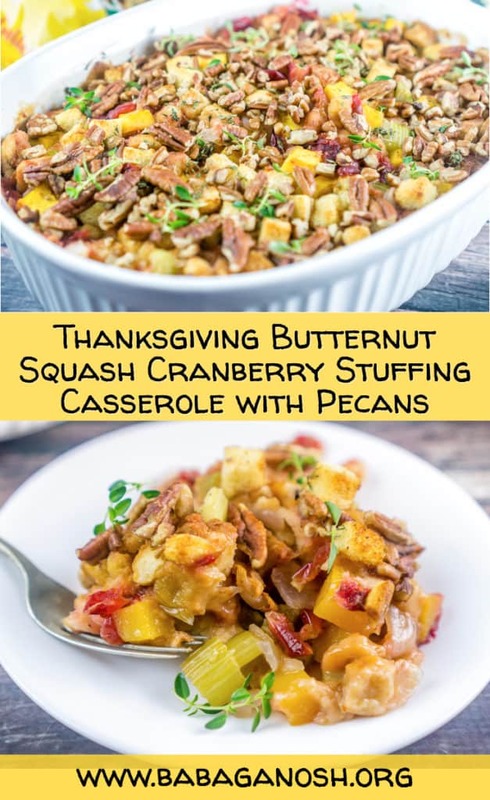 But I also wanted to share with you a different way to use this delicious ingredient – in a Butternut Squash Thanksgiving Stuffing recipe. This recipe is very similar to the one my mom and I make for Thanksgiving every November, and I look forward to it every year! This year I decided I would not wait until the holiday to make it. This casserole is great as a side dish with some Italian sausage or with some pan-fried turkey breast. It definitely does not have to be a once-a-year thing. I used Martin’s Potato Bread Stuffing for this recipe. I think we can all pretty much agree that potato bread is superior to all other bread, right?? So I thought, “why not use Potatobred Stuffing bread cubes in my stuffing recipe? ?” It is perfect for this recipe because the bread cubes are nice and soft, and they smell like freshly baked buttery bread. Your house will smell delicious before you even put the casserole in the oven. 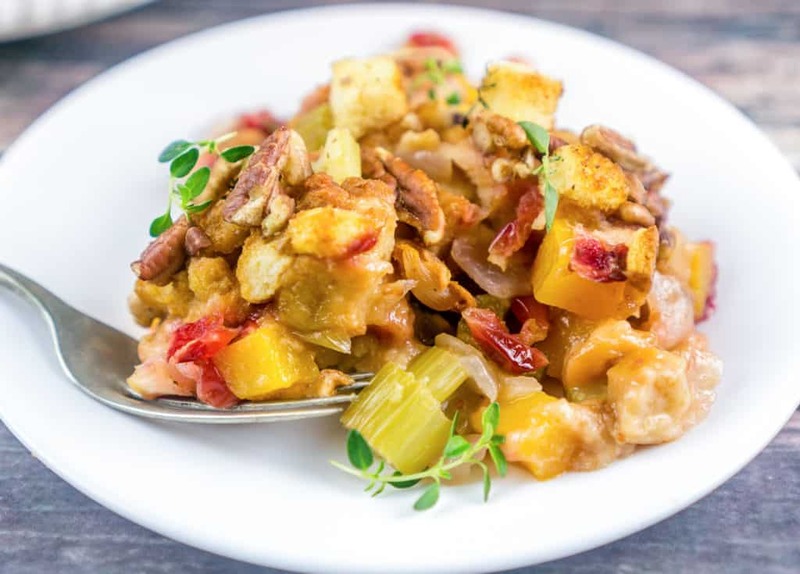 Added to the package of potato bread stuffing were cubed butternut squash, delicious cranberries in a quick sauce, and of course the classic celery, onion, and fresh herbs. I topped the casserole with pecans, so there was a great crunchy topping to this whole dish. 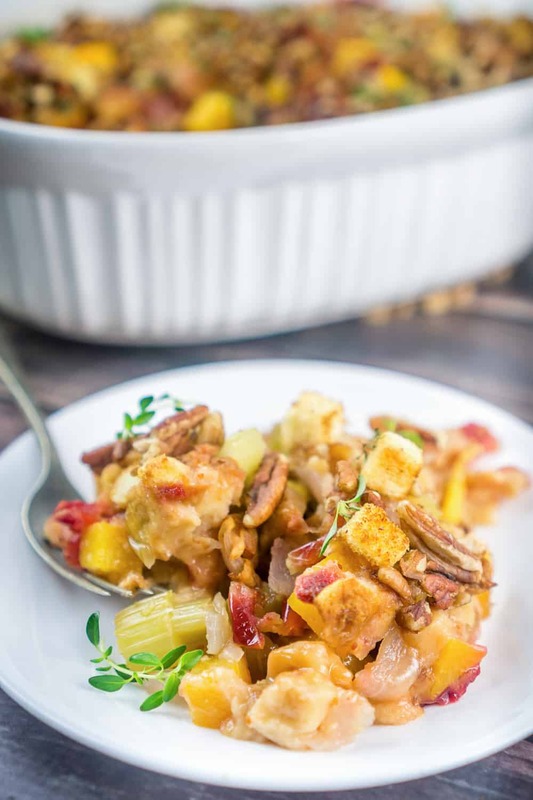 What I love about this stuffing recipe is that it is like an amazing savory bread pudding. Everything bakes together into a perfect harmony, and it’s got that sweet & salty thing going on. Make sure you take the time to cube the butternut squash into small 1/3 inch pieces, so that everything in the casserole is roughly the same size. Every bite of this dish is filled with classic Thanksgiving flavors. 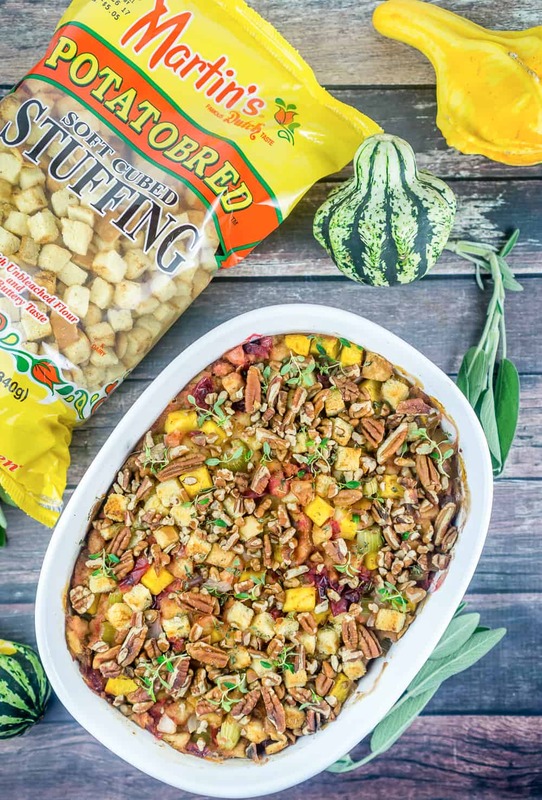 If you prefer your stuffing to actually be stuffed in the turkey (that’s a crazy thought, right?? ), this recipe works well for that too. Just mix everything together right before the turkey is ready to be stuffed and stuff away! 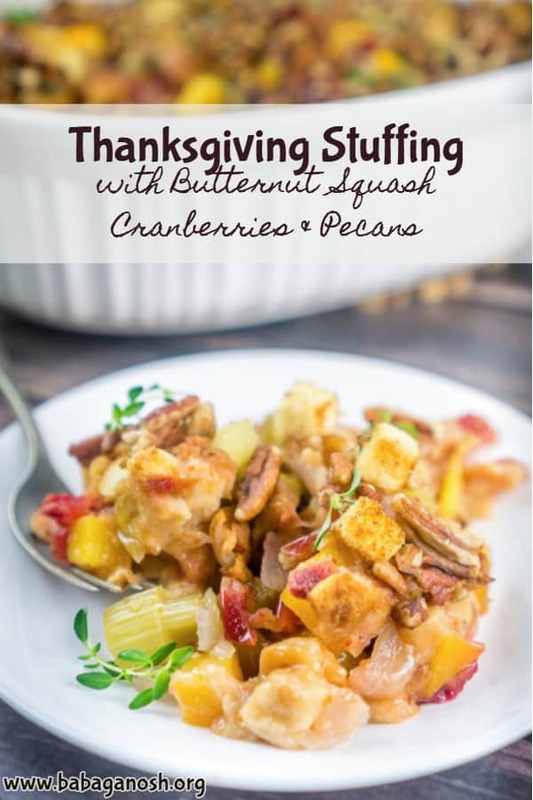 I have to admit I prefer my stuffing as a separate dish, so I will be sticking to this recipe below! 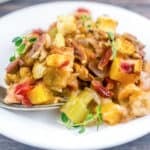 Switch up your Thanksgiving stuffing routine with this Butternut Squash Cranberry Thanksgiving Stuffing Casserole – you will never go back to traditional stuffing again! Preheat oven to 350F. Grease a 3 quart casserole dish (approximately 15 x 10 inches). In a medium sized sauce pan, combine the cranberries, orange juice, and sugar and bring to a boil. Lower the heat and allow to simmer until cranberries start to pop, approximately 5 minutes. While the cranberries are cooking, heat 2 tablespoons olive oil in a large pan. Add the diced celery and onions, season with salt and pepper, and saute for about 5 minutes, or until the onions and celery start to soften. In a very large bowl, combine the cranberry mixture, onion-celery mixture, cubed butternut squash, chicken broth, fresh thyme and sage. Mix well. Add the bread cubes and stir just to combine. Transfer to the greased casserole dish, top with chopped pecans, and cover with foil. Bake at 350F for 40 minutes, then remove foil and continue baking for another 20 minutes, or until the butternut squash cubes are fully cooked and fork-tender. Remove from heat , garnish with fresh thyme, and allow to cool for at least 5 minutes before serving. Have you ever added butternut squash to your Thanksgiving stuffing? Do you prefer your stuffing stuffed into the turkey, or stuffed into a casserole dish? This post was sponsored by Martin’s Famous Potato Rolls and Bread. The recipe and opinions are my own, as always.